China’s Party magazine “Party Building” recently published a piece titled “Ten Questions for Lee Kaifu ”[zh], questioning former Google China chief and online celebrity Lee Kaifu’s citizenship status, his motives, his public comments and political views. The piece, written by Zhou Xiaoping, a self-claimed macroeconomics analyst, criticizes Lee’s moral integrity and political views, including Lee’s advocacy of freedom of speech online and support for Chinese young liberals such as Han Han . He even questioned if Lee is really suffering from lymphoma. Chinese people always consider “obedience” as a good quality in a child. But I want my children to be reasonable children instead of obedient ones. The obedient child may blindly follow others, but not necessarily understand the truth, how can such children deal with the issues in society when they grow up. Reasonable children will listen to you because they think you are right, not because they are afraid of you, isn’t it better? 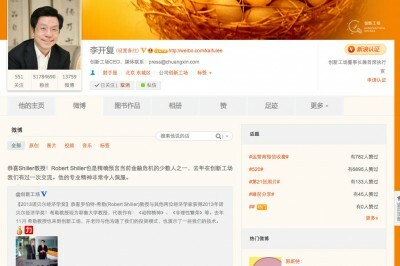 Lee was picked  by Sina as China's most influential micro-blogger earlier this year. However, a shadow fell over the Chinese Web when Lee KaiFu announced that he was diagnosed with lymphoma in September, 2013. You often said you are spreading positive energy and guiding young people, but all the young people you endorsed have bad morality, spreading desperate emotion with extreme hatred for China. The piece was soon picked up by Chinese media and spread on Sina Weibo. A search of Lee Kaifu’s Chinese name on Baidu yields articles and comments questioning his integrity and motives. Although most Weibo users dismiss the criticism, there are a lot of comments demanding Lee’s response, which were believed to be paid for by the 50 Cent Party , an organization which some believe Zhou is a member of. I’m not Lee Kaifu’s follower, but the “Ten Questions for Lee Kaifu” is too much. I don’t believe Big Vs have any hidden agenda; in fact, it’s the users who have raised them up on their shoulders. You can’t deny that Lee’s comments radiate positive energy, which generates positive feedback. The more people read the posts of people like Lee, the bigger the conversation gets. Lee Kaifu’s microblogging leads readers on to the idea that individuals can become strong, while the state media says only the government is strong. Some bloggers came up with a similar piece titled “Ten Questions for Zhou Xiaoping ”[zh], further questioning Zhou’s motivation. The best thing for being sad is to learn something. You may grow old and trembling in your anatomies, you may lie awake at night listening to the disorder of your veins, you may miss your only love, you may see the world about you devastated by evil lunatics, or know your honor trampled in the sewers of baser minds. There is only one thing for it then — to learn. Learn why the world wags and what wags it. That is the only thing which the mind can never exhaust, never alienate, never be tortured by, never fear or distrust, and never dream of regretting.